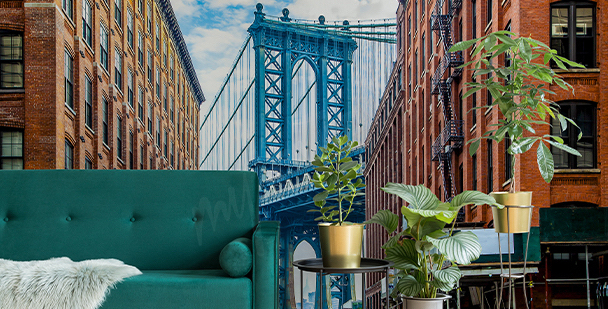 A New York wallpaper will fit the taste of every lover of huge metropolises. Glassed skyscrapers, characteristic yellow taxi cabs and the breath-taking Brooklyn Bridge – those are just some of the elements that make this city one of a kind. New York mural is also a great decorative solution for cinema fans. New York is one of the most popular locations chosen by movie directors from all around the world. New York wallpapers with a city panorama work great as a stylish decoration of an intimate living room, as they will optically enlarge our space. 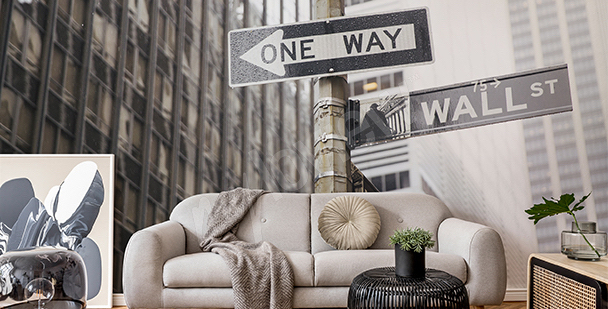 Images of New York on a living room mural will improve a modern and minimalist decor. A black and white panorama of New York will look great in a bedroom. A monochromatic color palette will not distort the harmony of an interior. 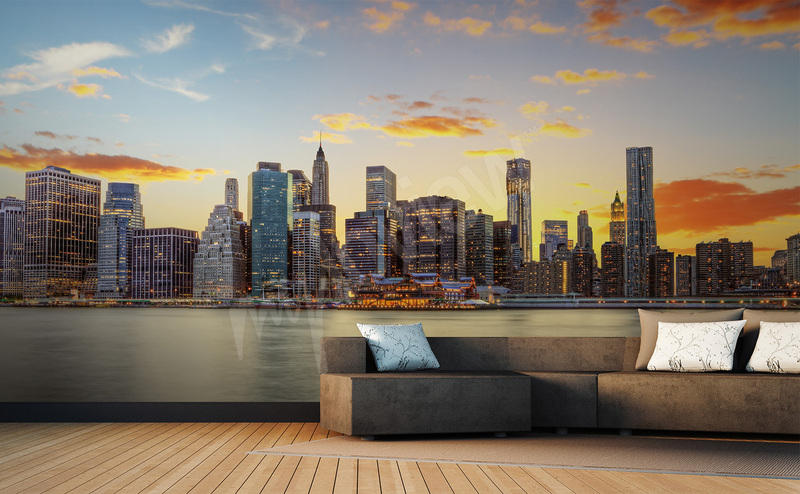 A mural with a view on New York will optically enlarge your living room and make it look more dynamic. Manhattan’s panorama placed on a hall’s wall will emphasize the modern look of your entire apartment. 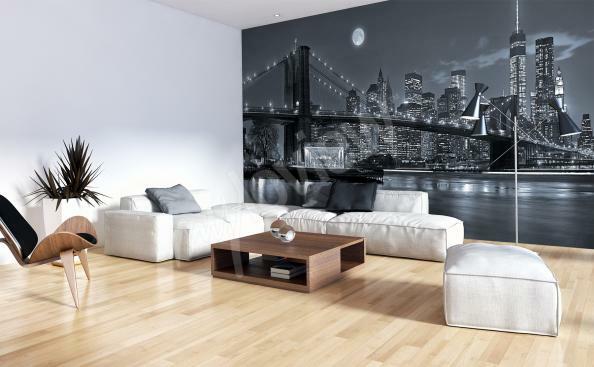 Brooklyn Bridge mural in black and white will emphasize the color scheme of your living room, becoming an interesting background for the whole décor. An illuminated panorama of New York can become the main decoration of your living room. Would you like to stroll down the Times Squate every day? It’s possible with a New York mural! 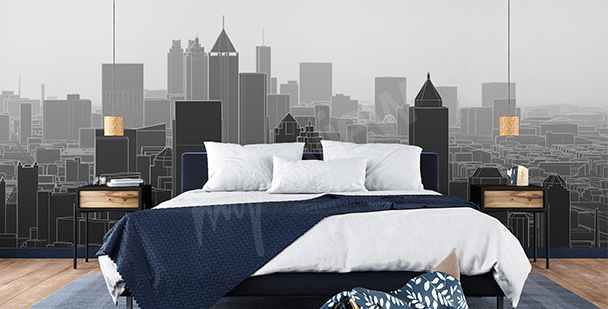 An industrial bedroom will become more intriguing when we’ll place a mural with a big city on one of the walls. A spatial NY mural will be a great solution for even the smallest of living rooms. Such decoration will attract all of the attention. A mural with New York’s skyscrapers will emphasize the raw character of your space, for example – a front hall. A famous architect, Le Corbusier, once said : “A hundred times have I thought New York is a catastrophe and fifty times: It is a beautiful catastrophe”. This quote best describes the incredibly complex character of this city. The city, that for many people is the symbol of freedom, new opportunities and success, and for others – of lost chances and failures. Le Corbusier would pay special attention on the innovative and stunning architecture – the skyscrapers, which began to pop out one after another in the 1930’s. He named them „the white cathedral of modernity”. He also believed that they are a perfect representation of the new era and it’s unlimited possibilities. New York wallpaper depicting ultramodern glassed skyscrapers against the background of a light blue sky, can be a great example of what would astound Le Corbusier over 70 years ago. 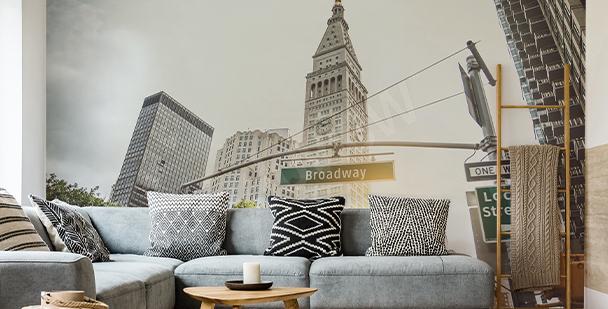 If you also love the modern design and bustling metropolises, then a New York 3d wallpaper will be a perfect decoration of your living room. 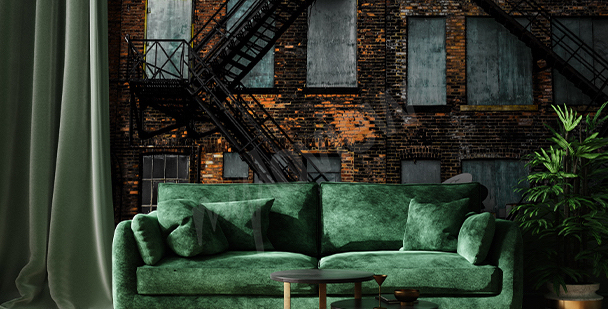 A spacious, industrial living room or loft is an ideal place for an expressive wallpaper with a view on a modern city. Wallpaper New York will fit nicely with an ultramodern design and minimalistic interior. A living room with a un-plastered, concrete or bricked wall can be decorated with a Statue of Liberty wallpaper. It’s green color, which is caused by patina that has developed on the copper form of the statue, will correspond well with both, the gray of concrete and brick red that is visible on your wall. 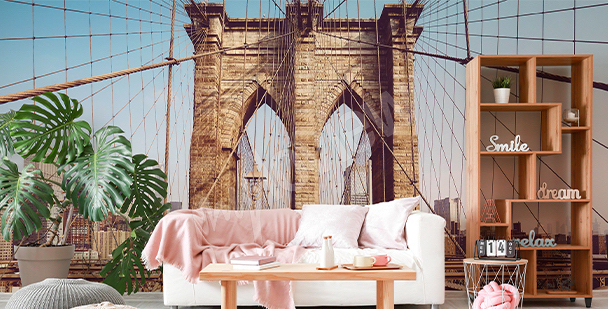 A New York wallpaper with an image of the Brooklyn Bridge and it’s steel construction, will be a great decoration of a typically industrial interior that is dominated by metal accents, such as lamps, furniture or accessories in form of bookends. A monochromatic interior, dominated by dark colors, can be brightened by a mural New York with a picture of the Central Park. This green oasis will bring into our interior a bit of nature, while being a counterweight for the metal elements of our décor. Not every industrial interior must be spacious. If you’re arranging a modern, but small living room, we offer you a solution that will optically enlarge your space. 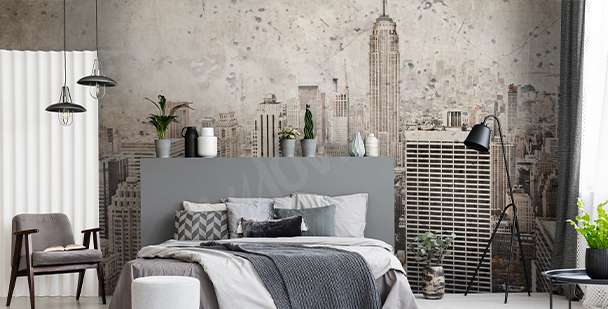 A wall mural New York with a city panorama will create a sense of additional space, thanks to which your room will seem bigger than it actually is. If you’re a fan of retro style and the aesthetics of the passed times, you may be interested in a mural New York, that will look great in a classic interior dominated by toned colors, such as bronze and beige, antique Art Deco-styled furniture and small knickknacks displayed on shelves. While arranging such interior, you should choose a black and white New York mural with an old photograph. One in sepia will do the trick, as well. This way, a wallpaper will create a harmonious and stylistically consistent décor. 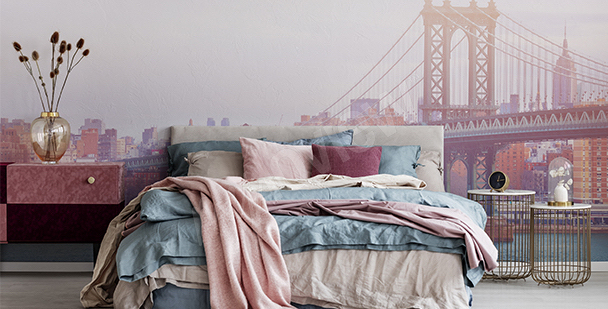 A romantic atmosphere in a bedroom can be achieved with use of a wallpaper New York night. A dark blue sky illuminated by the light of skyscrapers and planes flying over them, will make us feel like characters of one of the movies set in the Big Apple. A wallpaper New York night will look great not only in bright interiors. An illuminated city, even after dark, is full of colors. That’s why we shouldn’t be worried about such wallpaper making our bedroom even darker. 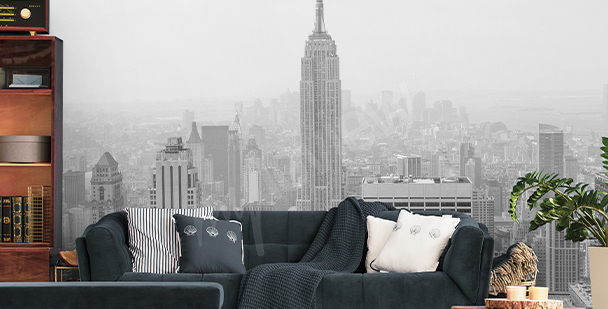 A modern office decor will look great when complemented with an image of New York’s panorama, for example black and white New York skyline or minimalist sketch of Empire State Building. It’s worth to select a wall mural with nature motifs, thanks to which our interior will become more friendly and comfortable of a workplace. Green, thanks to its calming properties, will not only make it easier to preserve harmony in our office, but also will soothe our tired eyes. A wallpaper New York with a view on the Central Park will be a great choice.